The availability of vast amounts of affordable computing power is driving a revolution in many fields of Science, including the Geosciences. The group has access to a range of such resources. We have a dedicated 750 core linux cluster Typhon for development and smaller tasks; and access to the University HPC provision. This includes the HPC facility BlueCrystal. Members of the group also use national supercomputing facilities, such as ARCHER. The group also has several high capability servers dedicated to specific tasks (for example, processing satellite data). 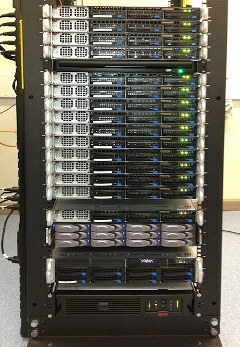 Typhon, the Geophysics group Linux cluster.